The final contenders have been revealed for this year's Walter Scott Prize for historical fiction. The winner will be selected from the six-book shortlist at the Borders Book Festival in Melrose in June. 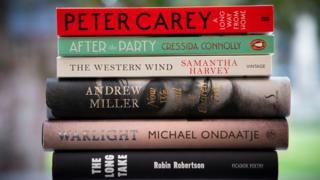 Works by Peter Carey, Cressida Connolly, Samantha Harvey, Andrew Miller, Michael Ondaatje and Robin Robertson are in the running this year. Judges said the books on the shortlist for the £25,000 prize were of "dazzling diversity". In a statement, the judges said: "What a privilege it is, to go on a journey through the fictional centuries, pick up gems that sparkle at us, and present them for new readers to discover. "From the dark edges of cities to insular rural communities, and from long distance road trip to intercontinental adventure story, our shortlisted books dare to investigate themes and issues in unique ways. "In its tenth year, it's fitting that the prize is pushing the boundaries of historical fiction, whilst maintaining great writing as its most important criterion." The winner will be announced at the Borders Book Festival on 15 June.